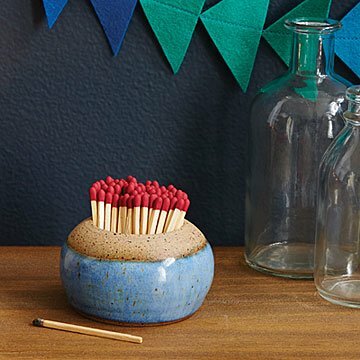 This match holder features an unglazed rim with the perfect texture to light strike-anywhere matches. Lighting your fireplace or favorite candle just got a handcrafted stoneware upgrade. Samantha Shamblin's wheel-thrown match holder features an unglazed rim with the perfect texture to light strike-anywhere matches (not included). Elegant unions of form and function with unique glaze variations, each one-of-a-kind striker is ready to display on your coffee table, bookshelf, or mantelpiece. Handmade in Richmond, Virginia. “I learn something new each time I’m on the wheel. I try to decide if something makes a piece look good or changes it completely. The possibilities are endless with pottery. I can see something in everyday life and I try to figure out if I can make it myself and put my own spin on it” says artist Samantha Shamblin. She has only been a ceramic artist for about 4 years and continues to teach herself new and improved techniques. Works with "strike-anywhere" matches only (not included). I use this match striker to store matches in on the stove when I cook. This was a good addition for the decor I have. Not only that, but it is a terrific functional piece that is very handy for candles. Received this as a gift. Love the design and color. I bought the strike anywhere matches as t says in description are the only matches that will work and they work perfectly. This product is great. I use incense a lot at home. The concept of having a vessel to hold my matches by my incense at the ready is handy. The unglazed rim around the opening of the vessel is used to strike the matches and works very well when you steady the striker with one hand and strike with the other. The bottom of the striker which is also unglazed works very well to strike the strike-anywhere matches too. I've read other reviews about people having trouble with the matches lighting but you need to allow the 2 different chemical portions strike together at the same time to allow the match to light. I have not had any problems with the vessel itself, only faulty match heads... Great product, would recommend. I recv'd this as a gift and when I tried to use it for the 1st time it would not light. I used the matches that came with it so I would assume that they would be sending the correct matches to use with the product. Will be contacting customer service to return for a full refund. Total disappointment! Loved the pretty pottery of this. But we light candles nightly, and wanted to get rid of the ugly stack of matchbooks/boxes we have on the counter. This looked perfect! We're pretty disappointed that no matches we have...in any of our boxes...will actually strike on this. Feels like it will work. But alas, it does not. A pretty little match holder it is. Get something scratchy to strike on, though.